Running from November 4 - December 29, 2012, for every IKEA Soft Toy or children's book you buy, the IKEA Foundation www.IKEAfoundation.org will donate one euro ($1.30) to education programs worldwide supported by UNICEF www.unicef.org and Save the Children www.savethechildren.net. 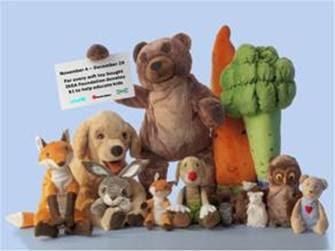 Additionally, in the aftermath of Hurricane Sandy, IKEA has donated 2,000 soft toys to the American Red Cross to be distributed to children in shelters impacted by the hurricane. IKEA has also provided the American Red Cross with nearly $450,000 worth of in-kind donations to be used in shelters in New Jersey and New York. There are also many thousands of dollars more of in-kind donations to Save the Children, local Red Hook, NY and New Haven, CT organizations, as well as IKEA co-workers in need. This year´s Soft Toys for Education campaign aims to provide quality education to children living in need in developing countries. Since the campaign started in 2003, donations from the annual IKEA Soft Toy Campaign have totalled €47.5 million (over $61 million), helping 8 million children in more than 40 countries enjoy their right to a quality education. IKEA Soft Toys range in price from $.49 - $19.99. New to the soft toys family this year are forest friends from the VANDRING series, like a hedgehog, a bear and an owl hand puppet that encourage caring about our environment. They appear on different VANDRING textiles, designed by Ann-Cathrine Sigrid Ståhlberg. Plus, they’re characters in the IKEA FAMILY children’s book, The Hedgehog Leaves Home written by Ulf Stark and illustrated by Ann-Cathrine. Funds donated to Save the Children will support projects to educate the most marginalized children, including ethnic minorities and those with disabilities and special needs in Cambodia, Vietnam, Bangladesh, Indonesia, Myanmar, the Philippines, Lithuania and Romania. Funds donated to UNICEF will support UNICEF’s Schools for Africa initiative to provide a quality education to children in Burkina Faso, Ethiopia, Madagascar, Mali, Mozambique, Niger, South Africa and Malawi. “Soft Toys are a great way for IKEA customers and co-workers to share a little holiday-season cheer with our own children, while helping other children we may never meet or even see, but who desperately need our support,” noted IKEA Foundation CEO Per Heggenes. *The Soft Toy giveaway is the first of two planned Random Acts of Life Improvement, unexpected out-of-store activities during which IKEA surprises consumers with tokens of appreciation to help improve their day. It’s part of the third annual IKEA Life Improvement Project, a program designed to offer consumers ideas and inspiration to help them make a positive impact on their homes and the lives within.